When the U.S. 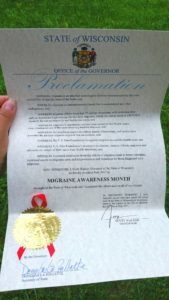 Pain Foundation announced they drafted a template to submit to the Governor’s offices for Migraine Awareness Month, I gladly offered to help obtain one for the State of Wisconsin. My past efforts as a Pain Ambassador for Wisconsin was successful during Pain Awareness Month. Twice, I successfully gained Governor Walker’s signature to declare September Pain Awareness Month and had no doubt he would continue showing his support for the Wisconsinites living with this neurological disease that currently has no cure. Once again, Governor Walker came through for a cause I strongly believe in. He signed the first proclamation declaring June 2017 Migraine Awareness Month throughout the State of Wisconsin. As someone that was diagnosed with the migraine disease 30 years ago and a mom of a teen that lives with abdominal migraine, this was a huge step for the whole migraine community.